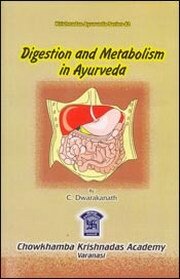 "Digestion and Metabolism in Ayurveda" is one of the scholarly works written by Prof. C. Dwarkanath. The textual matter presented in this book is of high standard and thus written to meet the needs of Ayurvedic teachers and research workers involved in the Ayurvedic system of medicine. The knowledge of the fundamentals of Ayurveda is a prerequisite to understand the concepts explained in this book. This work is critical scientific appraisal of the classical Ayurvedic concepts of Physiology and Biochemistry of digestion and metabolism. Ayurvedic concepts of Jatharagni, Dhatwagni and Bhutagni pakas involved in digestion and metabolism in the body are explained in the light of the contemporary modern medical and allied sciences. Whever possible and without altering the original meaning as envisaged in Ayurvedic classical texts. Ayurveda described thirteen types of Agni viz Jatharagni(one). Dhatwagni and Bhutagni which carry out the function of digestion and metabolism at different levels in the body. Prof. Dwarakanath has dealt the entire subject matter in six sections and vividly described the concepts of anatomical and physiological components involved in digestion and metabolism, Dhatwanipaka, Dravya Nistapaka, the role of Kayagnipaka, Rasa-Guna Virya-vipaka in metabolism, srotas and metabolism and the interrelationship of Anataragni and Kayacikitsa. The striking feature in this book is that the author has expensively quoted authentic Ayurvedic references from Caraka Samhita, Susruta Samhita, Astanga Sangraha. Astanga Hyrdaya and commentaries on these classical Ayurvedic texts. Also we find references from other ancient books whose concepts are useful to understand the Ayurvedic system of medicine. This reveals the versatility of the author and the depth in which he dealt the subject matter. The book is an authentic references text book on Ayurvedic concepts of digestion and metabolism and is useful to Ayurvedic teachers, physicians, postgraduates students of Ayurveda and research scholars interested in Ayurvedic system of medicine. As this book is in English language. It is immensely useful to international readership. The book is an asset to one's personal library too. Virya or Energy Modality; Two Broad-Based Classifications of Twenty Gunas; Eight Gunas with Virya Status. Dr. C. Dwarakanath L.I.M. (Madras) & Z.T. (Hamburg University) Principal, Govt.. Ayurvedic & Unani College, Mysore.